It’s slightly delayed but here’s the follow-up post on books I read when I was younger. These posts don’t necessarily cover everything i read but essentially the books I still have copies of. Something i didn’t realize when I decided to start this series of posts is that the majority of books in my possession from my school days are the ones covered in the Elementary School Years post with each era having less books. I suspect that had to do with Grade 7 being when I started to heavily get into buying comic books so most books I read as I got older were simply borrowed from the library. Comic books are a topic for another post though (likely an entire series). To begin with throughout grades 7 and 8 I kept reading Gordon Korman books and simply read the ones that were aimed for a bit higher age group than previously. Of the 3 books I have from this era, Son Of Interflux is one I still tend to read pretty much anytime I’m in the mood to read something familiar and spot it on my shelf. This works out to approximately once a year. The rest of this era mostly covers classics (well what I consider classics anyway). The possible exception here would be The Legend Of Tarik. I don’t remember much about this book other than the fact as a fantasy story I enjoyed it at the time. I haven’t re-read it in a very long time as it at some point migrated to my mother’s shelves and I only reclaimed it from there a week or so ago when it was being considered for a box of books to get rid of. I’ll be re-reading it this year and hopefully still enjoy it. I’m sure I will. As for the other books pictured I’ll just add a couple of quick notes as these are classics in my opinion so shouldn’t need much explanation. I actually have the 2 sequels to Born Free somewhere as well (likely that mysterious secret hiding place a few of my books seem to have found that I referenced in the Elementary School years post). The other note is about The Neverending Story. It was one of my favourite films growing up (and seemed to be on TV a lot as it sure seemed to be on anytime we visited any relatives. Hmm.) I watched the sequels too and enjoyed them all but never as much as the original. The second movie though is my favourite of the sequels. As such, when the opportunity to get the book arose I bought it just to get the full story. I hope you’ve all enjoyed this continuing bit of insight into what i enjoyed reading as I was growing up. Feel free to leave any comments either on the post directly or wherever you saw the link posted (Facebook, Twitter, Instagram). i’ll cover the books from my Secondary School years in a week or so. Reading and reviewing books isn’t an entirely new thing for me. In fact, I started doing so before I was even in High School. Those reviews were for the church newsletter and would eventually lead to my being named its’ librarian when they created a new one. Before you wonder too much, yes all of those books were church appropriate and it was an Anglican church. One day I’ll see if I can track down a few of those old reviews and share them. For now though, what books from that era stuck with me to the point that I still own copies? We used to always get book order forms at school and that was how I locked onto and began reading a series called Animal Inn by Virginia Vail. These were great books and if anyone had pointed out to me the protagonist was female I’m pretty sure my answer then would have been the same as it is now: So what, she’s great and the stories are good. At the time I was heavily considering pursuing the idea of being a veterinarian when I grew up which only made the series that much more fun. I had missed book #1 of the series but would eventually find it years later at the library so I have read it. Alas, when I left elementary I no longer had a way to order these books so missed the continuation of it. I did later on find book#9 for sale so bought it but I want to hold off on reading it until I can find the others I missed out on. The ones I read from back then are below. The other major books to come out of those book orders were the ones by an author named Gordon Korman. I loved his books and I’ll be talking about him a bit more later when I get to the books I read in Senior Elementary (grade 7 & 8). His series about the crazy adventures at a boarding school, his over the top stories about a teenage drummer, crazy camp adventures, and summer adventures were all great fun. However, a fair number of the books I have by him from this era have gone missing so I’m slowly having to track down copies in book stores (it’s a very slow process). The ones I do still have (plus one replacement) are below. One of my all time favourite books is The Cat Who Came For Christmas by Cleveland Amory and although my copy has seen better days it’s one I try to make sure I know precisely where it is when arranging my book shelves. If I suddenly can’t find it, I’ll re-arrange and go through everything until it is found. I still try to read it every so often. Another favourite is Max, the Dog that Refused to Die. It was about a dog that got injured while on a trip with his family and the long road to recovery. I think it’s hiding wherever the Robin Hood books are. Finally, there was the book that ended up having more influence on me than i ever could have predicted; C.S. Lewis’ The Screwtape Letters. A book told entirely in the form of correspondence between a senior and a junior devil and which dove into theology a fair bit. It was the first book I ever recall reviewing and I would later do a presentation on it in High School. I have little doubt the different style of it played a part in my decision to write my own book The Tannis Project as a series of blog posts. It is easily my favourite book by C.S. Lewis (and yes I’ve read quite a few by him) Meanwhile, you can see my worn copy of The Cat Who Came For Christmas and a pair of books I also reviewed back then below. My copy of The Screwtape Letters is likely being read to Max by Robin Hood or something. Finally to finish out this era we get to the Fantasy. More specifically we get to J.R.R. Tolkien. I’m not going to dwell on this one much other than to say I’m glad I obtained the books as a box set. This was back when they were selling them as 50th anniversary editions. I liked The Hobbit and The Lord of the Rings books pretty much equally and they are the source of quite a few headaches back then. Literally – I read each of the 4 books beginning with The Hobbit in a single sitting each time. Word to the wise, reading any of these books cover to cover without a decent break is going to lead to one very unpleasant headache later on. You can see the boxed set below. I know this has been a long post but I hope you’ve enjoyed getting a bit of a glimpse into what I enjoy(ed) reading. Expect the entry on Grade 7 & 8 in a few days. meantime if you have any questions or comments about anything mentioned here please leave a comment either here or wherever I leave a link to it. I like a wide range of music and will usually at least try something once but if I was to look back at what artists stand out in terms of how often and how much I enjoy listening to them – there are 4. If you’d like me to specify particular songs by any of the 4 or other possible songs please let me know in the comments of this post or wherever I’ve linked to it (Twitter, Facebook) and I’ll do so in a follow-up post. I haven’t really blogged here in the past year and a half other than mentioning Kirby’s passing a few weeks ago. A lot has happened in that time, things I always meant to post about as they occurred but didn’t. With that in mind what’s going on with me these days? 1) Last June, I rejoined Toastmasters. I’m taking it slow. I missed the environment it provided but I’m trying to avoid becoming as involved as I once was. I’m putting less pressure on myself as a result which is good. 2) I wrote a weekly blog, written in character by a nearly 200 year old Vampire. I did this from June of 2015 until November 2016. At present the gathered posts are going through the various stages of editing with an eye towards publishing it as a book later this year. 3) I began a book review blog in March 2016 over at Writefully Written. I used to do book reviews for the church newsletter when I was much younger and I’m enjoying doing them again. Plus, I like bringing attention to authors that aren’t as well known. 4) My NaNoWriMo region got divided into smaller sections and I became the inaugural liaison for the newly-minted region that I resided in. That was quite an eye-opening experience and I enjoyed it. I particularly enjoyed that it allowed greater focus on the writers in this area in providing them more oppurtunties to gather as a group. 5)My health has been not at its’ best the past few months. The doctor is doing his best though to help figure out the cause and help me get better. At this point, it’s a minor nuisance most of the time and having to wince in agony for a few moments the rest of the time. There’s more stuff to talk about but I’m going to end this post here. I’ll delve into more specific topics in upcoming posts. It has been a long time since I posted an entry and a lot has happened that I want to talk about but today I just want to talk about the biggest change in my life. On January 19, 2017 at the age of 17, only a few months shy of 18, my wonderful cat Kirby took his last breath. I know the Veterinarians all said I did everything I could have, that I shouldn’t feel guilty about being unable to do more, but that doesn’t mean there is a feeling of failure hanging over my head. I’d been owned by him since he was a kitten, the reality that one day I wouldn’t have him in my life just never occurred to me. This was despite a near constant worry any time he went for a check-up. You see, since the spring of 2011, Kirby had been diagnosed with and been treated daily for diabetes. He had lived with me through 5 different moves over the years and always settled right in at each new location. He preferred, if in his carrier, to travel by bus and on more than one occasion other passengers would ask if there was really a cat in the carrier because he was so quiet and relaxed. He loved to lay on me if I was sitting or reading and even in his final days would still run around and jump up on counters and get into trouble. He never let age define him, he was still that kitten at heart. A couple of years ago, the vets and I had agreed that it wouldn’t be the diabetes that would be his end, it would be something else. The diabetes was under control and as managed as possible. Kirby and I had that stuff figured out. It turns out we were right. When I rushed him to the vets’ office on the morning of January 19, 2017, it had seemed as though his blood sugar level had dropped but that wasn’t the case. No, what we learned is his chest had filled with fluid and his blood pressure had dropped extremely low, that he had possibly suffered a heart attack. No matter what they did, Kirby was dying right there faster than they could help. I did the only thing I could do and held his head in my hands, looking him in the eyes as the vet put him to sleep. My best friend, my baby boy. I have an urn of his ashes sitting next to a digital photo frame now. It cycles through numerous pictures I took of him over the years and it is within easy view of the computer so I can in a sense still have him nearby physically. As hard as saying goodbye to him might have been, there has been a slowly dawning realization that for the first time since I was 21 I have to get through adulthood without him. Just well said. I’ve done NaNoWriMo for 4 years now. I especially think folks need to pay attention to her final point. The past few years have seen writing once more take a central focus in my life. That I let it slide for so many years is a disservice I did unto myself. Now I find that like much in my life I’m now in the nearly perpetual mode of “catching up”. When I was in Toastmasters, I had hoped that preparing speeches would at least keep me writing somewhat. At first this was the case but over the many years I was with that organization I found I was doing this less and less. I was still preparing speeches but I was writing them less and less often, opting instead to prepare them almost entirely in the mind. In part, this allowed me to look less at notes when speaking but also to have greater flexibility base don how the audience responded. While this worked great in Toastmasters it meant I was not writing. It took my grandfather’s death, as mentioned in a previous post, to cause me to really look at whether I truly wanted to write. The answer in my mind was a resounding “Yes!” and through participating in NaNoWriMo (National Novel Writing Month) for the first time I “jump-started” my writing once more. One can only be fuelled by such a start for so long before old habits return though. I had supporters and friends form my family and Toastmasters but was that enough? I needed other writers to relate to, to motivate me, to help me keep that new fire lit. In time, I’d be able to be more self-motivated but in those newly taken baby-steps as I rediscovered writing? Support and encouragement was going to be needed and I knew it. That was a few years ago. I’m writing still, sometimes even daily. Ideas being explored, stories being woven, characters finding life… all of it enriching. Some day I’ll finish a project, see it through fully and share it with all of you. In the meantime though, I want to end this post by mentioning that in the weeks to come I’ll be doing my part to help promote others in the writing world. To be more specific, one of the writers I made the acquaintance of early on when I got back into writing is Kelly Blanchard. She has not only been incredibly helpful when I have questions but also maintains a weekly blog to help other writers. I’ll provide a link at the end of this post. She’s also undertaken a new project: conducting very unique author interviews as well as interviews with a character created by each of those authors. These interviews can be found at another blog Kelly has set up. In closing, this post is a thank you to everyone out there who has encouraged and supported me the past few years as I got back into writing. I hope I am able to do all of you proud in the months and years to come. Giving back. It’s a term many tend to use to explain why they do a good deed. I mention this because it was the result of giving back that ultimately led to what I find an interesting occurrence the past few months. Every year, the city of Cambridge, where I reside, honours people in the community who have shown passion in their contribution to arts and culture in the city. Named in recognition of the late city councillor Bernice Adams, the Bernice Adams Memorial Awards are awarded in several categories pertaining to the arts. In late February, I received a phone call from a friend who was filling out the nomination form as he intended to nominate myself in the category of Literary Arts/Communication due to my years of work within Toastmasters. My own growth within that organization and subsequent moving on to help strengthen and expand the local clubs so that more people could benefit seemed to be why they thought I should be nominated. 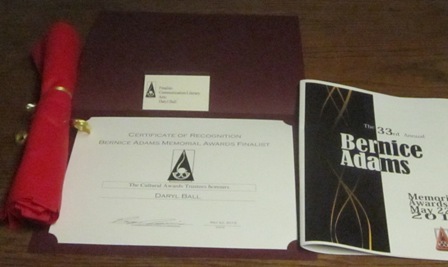 A letter arrived a few weeks later revealing that I was no longer just a nominee but was one of four finalists in my category and the date of the awards. I wasn’t sure what to think. I had merely done what seemed the right thing to do within Toastmasters, namely give back to it after all it had done for me as far as helping to grow my self-confidence. To learn I had not only been nominated but was also a finalist for such a major award from the city for doing so…it left me wondering to say the least. That awards night came this past Friday, May 22. I saw a great number of familiar faces and met several individuals I had only ever heard about before. There was great entertainment from talented musicians, great food, and great coffee. The importance of the evening further reflected by the presence of the Mayor, the entire city council, and our local member of the provincial parliament. It was thrilling to watch so many deserving people be honoured by the city. While I was not the eventual recipient of the award in my category this year, I am grateful to have even have been considered. It left a further lasting impression upon me of the fact that we rarely have any idea of the lasting impact we can have on other people’s lives with what we do. I am left with one final task coming out of these awards. Who can I nominate next year so they too can be recognized? After all, what better way to give back to the people who believed in me then to show my belief in someone? A little over 11 years ago I went to my first Toastmasters meeting at the behest of my boss in order to improve my self-esteem and fight my social anxiety. Everyone was so much older than I was but they stood and applauded after I spoke, they talked with me as though I was an equal, and in time I began considering them friends. After so many years, I still think of them that way, even when I meet a Toastmaster for the first time. I joined for self-confidence and self-esteem reasons and got so much more out of it than I could have ever expected. The first presentation I gave at one of their meetings, I gripped the lectern so tight, the claw marks are still evident today. I looked at the floor, I looked at my notes, and my heart was racing far too quickly to be considered healthy. The evaluation I was given afterwards was glowing in its’ praise of all the things I had done well and gave me minor suggestions for improvement. With each presentation that followed I got a little bit better, the notes stopped being needed, the eye contact became more regular, the vocal variety improved, and I even eventually stopped gripping the lectern for dear life, opting to step away from it and incorporate body language. After 6 speeches in the first manual of speech projects had been completed I was given a certificate, and encouraged to keep going. I did, and I joined the club’s executive committee. A certificate for Toastmasters World Headquarters came when I finished that first manual of 10 speeches. I felt confident and so I kept going and started working from the advanced manuals that specialized in various areas such as storytelling, speaking to inform, or humour. I kept taking on greater and greater responsibilities within the club and soon lost track of the achievements I was accumulating. Then at a holiday party while I was club president, more than one person who had been involved longer than I had suggested I try for the role of Area Governor, and that they felt I had what it took to fill that role. That was a big step, it would mean overseeing several clubs as well as the fact that it wasn’t a position I could be elected to. I had to be appointed by the District Governor, which meant a vote of confidence on the part of someone many levels above myself. When I got the phone call that following May and was appointed, not to the Area the club i had been in belonged to but rather another Area full of clubs I knew very little about, i felt amazed at the level of trust. Over the following year, I learned a lot from the 6 clubs in that Area, one of which formed during that time. I also helped another new club in my home Area get through their first year as a club, and was holding membership in two clubs as well. Needless to say I was heavily invested. One of the amazing things that came from that year and the earlier achievements is that when my term as Area Governor ended I was only a few projects away from achieving the highest level of recognition that a Toastmaster can receive: The Distinguished Toastmaster designation. In November of that year I received a plaque from Toastmasters International and was recognized buy the District in front of my peers at their Fall Conference with a medal. What to do then having achieved far more than I had set out to? I started focusing on going through the projects again with new ideas and being held to a higher standard. I took on the role of Club President again for a year and now with that term over, I’m taking what I feel is a well-earned hiatus. A full list of achievements can be found at the end of this post. I will forever recommend Toastmasters to everyone. For improving self-esteem, bolstering your presentation skills, managing meetings, anything at all, it can help improve you in those areas. As human beings we thrive on communication and Toastmasters provides a means by which we can become the best communicators we can be. It’s been a long time. The world of blogging has changed alot since I last did this but I find more and more each day I need and want to put my thoughts down somewhere. To organize them if you will. This isn’t going to be about business. It’s about journeys. A journey through my memories to better understand where I’m headed. A journey of growth and learning to reach the present day. A journey forward and of discovery. Hopefully, if you come along for the ride something will be learned..by you, by me, by whoever reads this. Yes, I do talk about Toastmasters a lot. There’s a reason for that….